World Today News: Revolt against the banks? It is customary to criticize finance and its avatar "ultra-liberalism" but often not for the right reasons. Right and left statists and populists are not at all against counterfeit money created out of thin air. Simply, they dispute its distribution: they want more for them, for their use, to buy voters. Right-wing statists want more counterfeit money for the military, police, security, foreign operations, defense, the greatness of the country, terrorism, state capitalism, big industrial projects. Leftist statists want more counterfeit money to fight against poverty, against global warming, to subsidize immigration, to "educate" the masses. The populists want more counterfeit money to distribute to anyone who wants to vote for them. 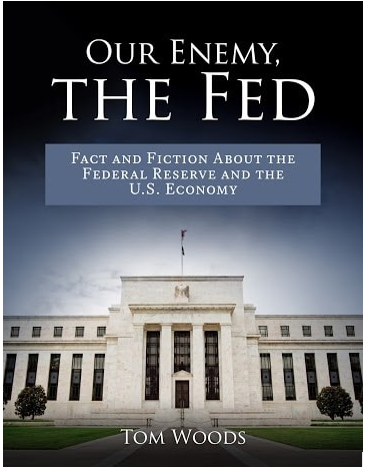 Recently Tom Woods published a (free) book entitled Our enemy, the Fed - Facts and Fiction about the Federal Reserve and the US Economy. This book has the merit of exposing the good reasons why the Fed (or any central bank of the monetary zone in which we live) is harmful. The Fed has destroyed the dollar, which has lost 95% of its value since the creation of the Fed. The Fed is forcing ordinary people to invest in equity markets where they do not necessarily have to do anything simply because accumulating bundles of dollars would be a suicidal retirement plan because of Fed inflation. By artificially lowering interest rates, the Fed creates the conditions for economic cycles, the recession-expansion patterns of economic activity that give rise to bad money allocations followed by devastating crashes for a large number of people. .
All these points obviously also apply to the European Central Bank, which I remind you of, has set an annual inflation target of close to 2%. That is to say a monetary erosion or an arbitrary non-consented tax of 2%. Since the ECB has not pursued its objective of monetary erosion since the 2008 crisis, it has turned into a negative rate, another way of depriving savers of a decent return on their economies. Of course, these facts are never explained by the big media, owned by big actors of crony capitalism. These big media let stateists express themselves on the right and on the left, economists or experts paid by the public purse, the professionals of the agit-prop as surety for their phony pluralism and all those who take bad decisions without supporting it. the results. They are not intended to relay the "off-system", the real contradiction. 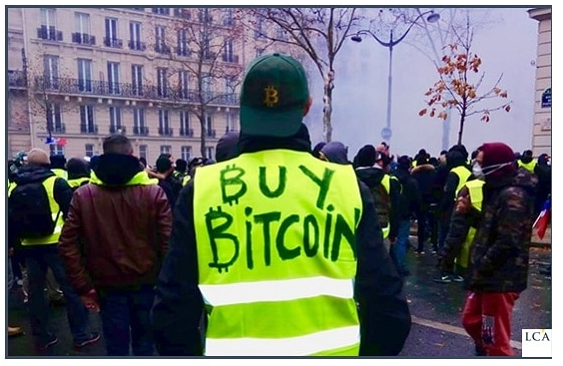 Hence probably the initial fermentation of the Yellow Vests movement. Despite this foreclosure of the media, finance still has a bad press; even if people do not analyze the cause of the problem (the institutionalization of counterfeit money in the form of credit and its centralized administration), they feel its effects (decrease in their purchasing power). Hence probably the recent call for yellow vests to withdraw money from banks. This is reminiscent of the call of Eric Cantona footballer in October 2010. Call that fizzled. If people really knew the financial system, they would understand that it can run without deposits, that "their" money does not matter ... Banks lend money that does not exist. In addition, all legislation requires you to have a bank account, you discard the use of cash and prevents you from entrusting your savings to whoever you want. This appeal is as vain as a tax strike and will probably remain, like that of Cantona, without consequence. On the other hand, what has existed since 2008 and is gaining momentum is the private digital currency like Bitcoin and its cousins. This currency was created by Satoshi Nakamoto in response to the spoliation organized by the central banks. Only a monetary system "Based on cryptographic evidence rather than trusted third party"he said, explaining his project ten years ago, can withstand censorship and "escape the risk of arbitrary inflation of centralized currencies". For the moment, the movement of the yellow vests has not given rise to any tension on the interest rates of the French debt. Financial markets speculate that the move will be muted or that the European Central Bank will do "all that will be needed", ie more counterfeit money, more negative rates, more spoliation. But as I repeat tirelessly, the public debt will never be repaid and it will one day admit it. This will involve a massive destruction of private savings and a return to capital control. The control of capitals is the expression consecrated to say that ordinary citizens will be unable to escape their bank and cut arbitrary taxes decreed for "public safety" or "the interest of the Nation" . Your insurance against this event, to not lose the savings of your life, is to have 10% of your cash in gold. But it's also taking a small lottery ticket by transferring some of your savings into bitcoin. It will be much more effective than all calls to bank run. Technology today allows you to trade, buy, sell, transfer money without banks.